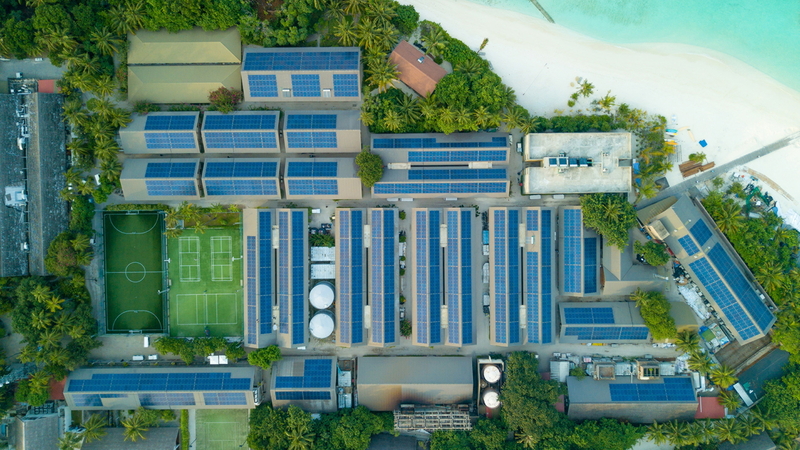 Four Seasons Resort Maldives at Landaa Giraavaru recently connected its first RoofSolar inverter, and in doing so turned on one of Maldives’ largest resort-based solar installations. It is estimated that the new solar set-up will produce between 900,000 and 1.1 million kWh of energy every year and save between 250,000 and 300,000 litres (55,000-66,000 gallons) of diesel, which corresponds to 650-800 tons of CO2. Putting this data into perspective, the annual savings equate to powering all 103 of Landaa’s luxurious guest rooms, villas, and suites for 32 days or charging one of the resort’s eco-friendly electric golf cars more than 82,000 times. In daily terms, it’s the daily equivalent of powering 15 Villas for 24 hours; applying reverse osmosis technology to 540 cubic metres (19,000 cubic feet) of water at the resort’s onsite desalination plant; or washing and drying 3,350 kilograms (7,400 pounds) of laundry. Conservation at Landaa has been a serious topic since the resort opened in 2006. Plastic reduction has been a top priority with paper straws introduced in 2010 and reusable glass water bottles in 2012, saving 365,000 plastic bottles annually. The latest partnership with Parley recycles any leftover plastic into clothes, shoes and more. In addition, Landaa runs one of Maldives’ leading centres of marine conservation and research, working in partnership with local and national environmental agencies and employing 10 full-time marine biologists to deliver pioneering activities every day including turtle rehabilitation, coral propagation, manta research, sustainable fish breeding, anemone mapping, dolphin ID and more. See latest HD Video Interviews, Podcasts and other news regarding: Four Seasons, Maldives, Solar Power.